How to make Portuguese sweet bread. To make the sponge, stir together flour, sugar, and yeast in a small bowl. Add the water and stir until all ingredients are hydrated and make a smooth batter. Cover with plastic wrap and ferment at room temperature for 60-90 minutes, or until the sponge gets foamy and seems on the verge of collapse. To make the dough, combine the sugar, salt, powdered milk, butter, and shortening in a 4-quart mixing bowl (or the bowl of an electric mixer, which is what I use). Cream together with a sturdy spoon (or the paddle attachment) until smooth, then mix in the eggs and the extracts. Knead by hand (or switch to the dough hook) and mix in the sponge and flour (I wait to change out the attachments until most of the ingredients are mixed, as it seems I have a problem getting the dough to grab onto the hook if I switch too early). Add the water, as needed, to make a very soft dough (more than likely you will not need the full amount of water, but it can vary due to factors such as the moisture content and protein percentage of your flour). The finished dough should be very supple and soft, easy to knead, and not wet or sticky. To achieve this will take 10-12 minutes with the mixer and close to 15 minutes by hand, as dough with high amounts of fat and sugar usually takes longer to knead because the gluten requires longer to set up. The finished dough should pass the windowpane test (see note below if you are unsure what this is) and register 77F to 81°F Lightly oil a large bowl, put the dough in the bowl, rolling it around to coat with oil. Cover with plastic wrap. Ferment at room temperature until dough doubles in size, around 2 hours. 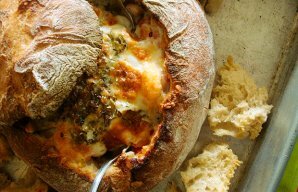 Remove dough from bowl, divide in 2 equal pieces, and form each into a boule. Lightly oil two 9-inch pie pans and place a boule, seam side down, in each pan. Mist with spray oil and loosely cover with plastic wrap. Proof at room temerature for 2 to 3 hours, or until the dough fills the pans fully, doubling in size. 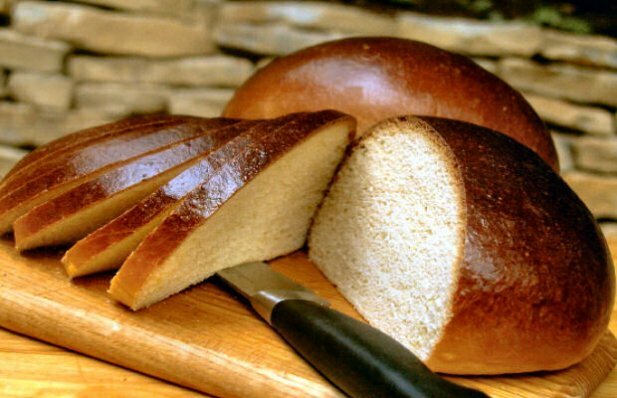 (If you want to bake only 1 of the loaves, you can retard the second in the refrigerator for 1 day, but it will take 4 to 5 hours to proof after it come out of the refrigerator.). Very gently brush the loaves with the egg wash. Preheat the oven to 350F with the oven rack on the middle shelf. Bake the loaves for 50 to 60 minutes, or until they register 190F in the center. After 30 minutes, check the loaves and rotate 180 degrees, if necessary, for even baking. The dough will brown rather quickly (please see intro), long before it is done. When done, the loaves will be a rich mahogany brown. Remove the bread from the pie pans and place on a rack to cool. The bread will soften as it cools, resulting in a very soft, squishy loaf. Allow the bread to cool for at least 90 minutes before slicing or serving. *Windowpane Test: Cut off a small piece of dough and gently stretch, pulling and turning it to see if it will hold a paper-thin, translucent membrane. It it falls apart before it make this windowpane, continue to knead for another minute or two and test again. 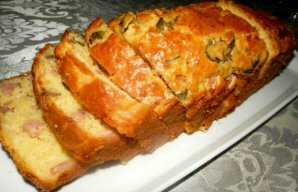 This Portuguese bacon and olive bread (pão de bacon com azeitonas) is easy to make and delicious. 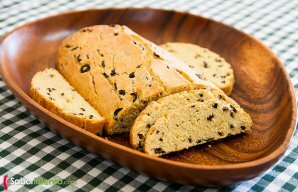 This deliciious Portuguese olive bread recipe (pão de azeitonas) is for all the olive lovers out there.